Pandora is the newest character to appear on Vera Lane. She comes with three flower stamps and a flying bird stamp image. Scale the digi images up or down for your paper craft needs. Make thank you cards, birthday, or just a cheery hello. The versatile image set can be used for your own interpretation. 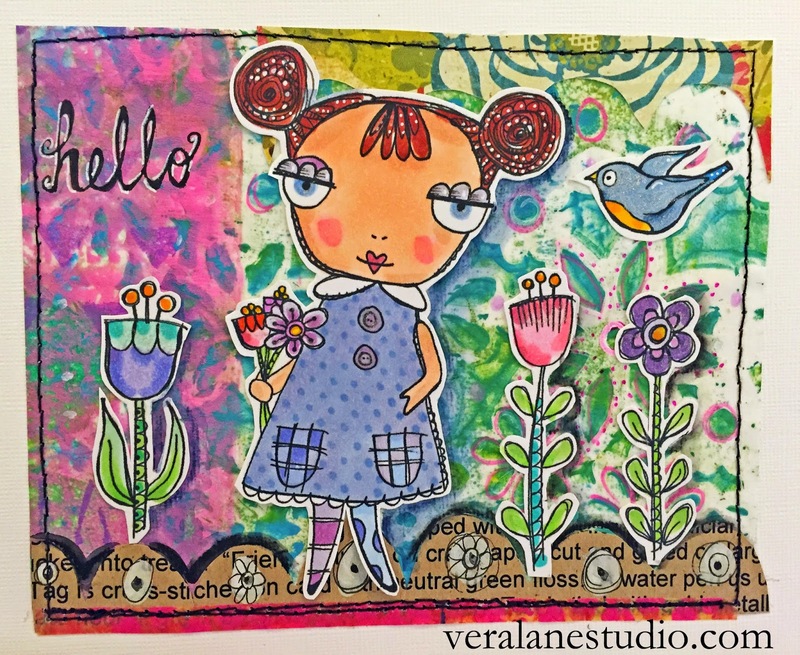 Use for ATCs or your personal art journal. This digi set is available now for instant download. Check out this set and others at the Vera Lane Studio Etsy shop today! Nellie is hostess this week at the Stampotique Designer's Challenge. Show us your favorite background technique and get a chance to win some of our lovely deeply etched stamps. My favorite background is anything mixed media. For today's card I begin with gesso, scraped painted with a spend gift card, then added bits of collage scraps. I like to add pencil scribble and doodles. Here I'm using Roc's bunny , my mini cube and collage definition. Roc's bunny is paper pieced with acrylic detail. I like the play of random and creating asymmetrical balance. Astrid is over at the Stampotique Designer's Challenge this week requesting the use of neon colors. While it's not typical to use neon in my images, I do like to use it to add a punch in my backgrounds. This cards features "Peace and Love" from artist Kate Crane. I hand wrote one of my favorite quotes with black gel pen, accented with white Signo. The top and bottom of the card has my homemade washi tape. I had made a pile of gelli prints and the back of this card is made from the "waste" roll-out paint in-between prints. While I had the colors out I also created very fast and funky washi tape using Micropore surgical tape. Select about three colors and smear on tape with fingertip. Dry. Store on freezer paper or other shiny paper. Our design hostess Carol is asking for us to feature stars this week. I created a painterly background and added my stars with white Gelly Roll pen. My starry night hangs above three of my stitched houses stamp. 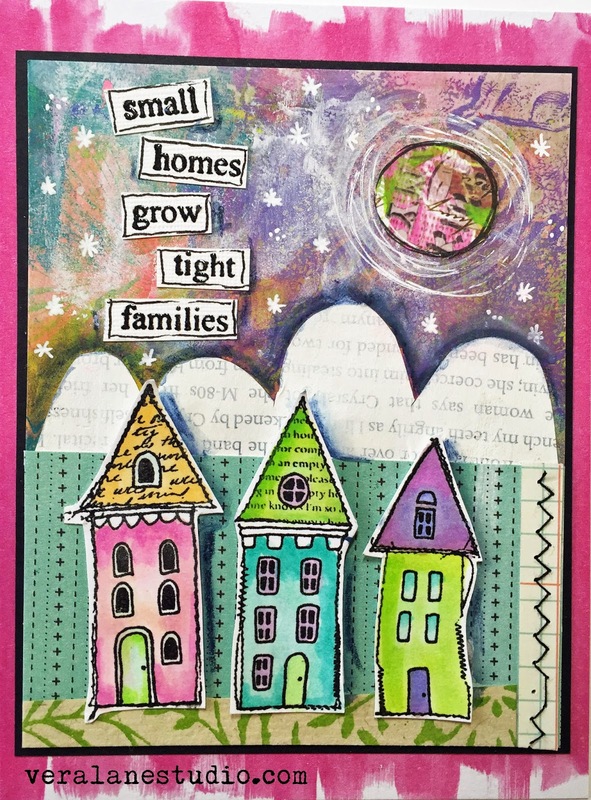 My "Small homes" quote is stamped with black Versamark and clear embossed. A scalloped cloud is cut from whitewashed book text. Scraps and stitching complete the composition. So stamp or draw your stars in a Stampotique featured composition and have a chance to win $30 credit in the Stampotique online shop. Much of my inspiration comes from my years working with children. One of my favorite lessons for my fifth graders were Modigliani portraits. Students learned to exaggerate proportions with elongated necks and faces, often giving a lyrical tilt. 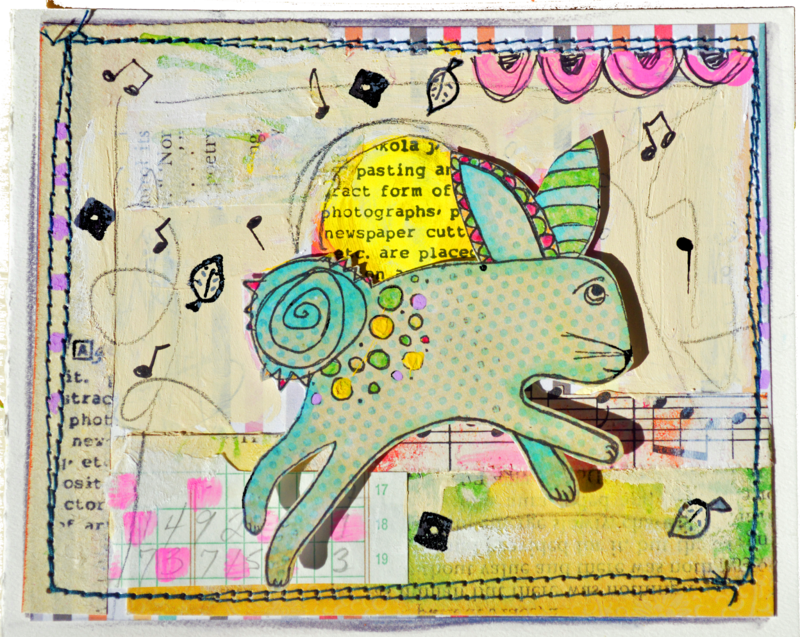 The digi stamp set, "Ladies who lunch" come right from my lesson plan journal. The digi ladies are designed to wear their own personal hats. With a little resizing, the hats can be customized to swap with any of the ladies in the set. While none of these digi hats have the couture look a Phillip Treacy , I found some of his quotes appropriate for some simple card and tag designs. Fast Art Doll: The image on the left is a quick art doll. I painted some canvas, cut into a rectangle and sewed in an oval base. It sewed quickly on machine but you can use hand stitching as well. The body is filled with rice and the digi image (sized, colored and trimmed) is tucked in the opening and stapled shut. Obscure staple with fabric, a ribbon or button. How fun to create a set of tall and short ladies? This set and other images are available in my Etsy shop for instant download. The six digi stamps are downloaded in 300dpi png format and will be clear of watermarks. They are designed for unlimited personal use. So make some cards and tags for the ladies and perhaps try some fast art dolls.